There are reasons tourists go where tourists go. Their chosen spots offer a concentrated experience in a little time. Forget nuance. Tourists want it all now! Helaine and I live in Irvine. It’s near LA. It’s not LA! It’s a nice place to live, not a tourist destination. With that in mind we headed north to Los Angeles with my niece Melissa and her husband Mark. Time was short. Their honeymoon flight to Fiji would take off with or without them. The corner of Hollywood and Highland is within walking distance of Stef’s apartment. How could we not go? Once upon a time Hollywood was sold as the center of movie making. Today sound stages and studios are spread out. Lots of movies and TV shows looking to save money are made outside California. I’m not sure what tourists expect to see when they arrive? As is the case in Times Square, a large part of the local commerce is centered around costumed characters who pose for tips and stores selling t-shirts and tsotchkes. Our next stop was Neptune’s Net, just past the Ventura County line on the Pacific Coast Highway (which no one here ever says–it’s the PCH). Neptune’s Net is a seafood stand. It attracts lots of bikers, day trippers and those who remember it from a show starring Olsen Twins. We chowed down, then crossed six lanes of PCH and climbed down a hill to get to the ocean. It’s a surfing beach. I brought a long lens! We’d gotten to this end of Malibu by driving up the Ventura Freeway then through some twisting canyon roads. My passengers weren’t thrilled about a stomach sickening repeat, so I turned south and hugged the coast. More traffic. Fewer curves. We stopped at the Rosenthal Wine Bar and Patio. As the designated driver (and photographer) I headed to the beach while everyone else sampled wine. More surfers for me and some very nice views toward Santa Monica and beyond. By this time it was getting late. We headed inland on Sunset, taking a very brief detour to see the homes in “The Flats” neighborhood of Beverly Hills and Rodeo Drive. Heading down Wilshire we passed what we think was the premier for the new Jake Gyllenhaal, Hugh Jackman movie. Did anyone in the car see either star? Maybe. Let’s just say I won’t dispute any stories. Stef was in charge of delivering our charges to the airport, so Helaine and I said goodnight then headed through a mid-evening crush of traffic to the OC. It’s our first SoCal experience shuttling tourists. I’m hoping we passed the test. We’re back. The Foxes are home after making the 12.5 hour door-to-door cross country jaunt. I’m still not sure why, but sitting in a seat for five or six hours is exhausting. I scheduled this day off to recuperate from my trip. At the moment that feels like a good decision. Instead of taking a laptop to California I took my tablet. That’s good news bad news. The tablet saved bulk and weight, but it still can’t do 100% of what a laptop does. That’s especially noticeable in photography where the RAW files I shoot aren’t yet compatible with the tablet software I use. There’s an animated slideshow with pictures from this spectacular Southern California day at the bottom of this entry. Make sure you take a look. Anyway, this seems like a good time to catch up on Sunday, our busiest day and my camera’s busiest! We started with brunch, the final event in Bar Mitzvahthon 2012. Note to self: No eating for the next week… maybe two. We met up at Stef’s apartment just under the Hollywood Hills. From there we all headed to Fairfax High School, site of a weekly flea market. 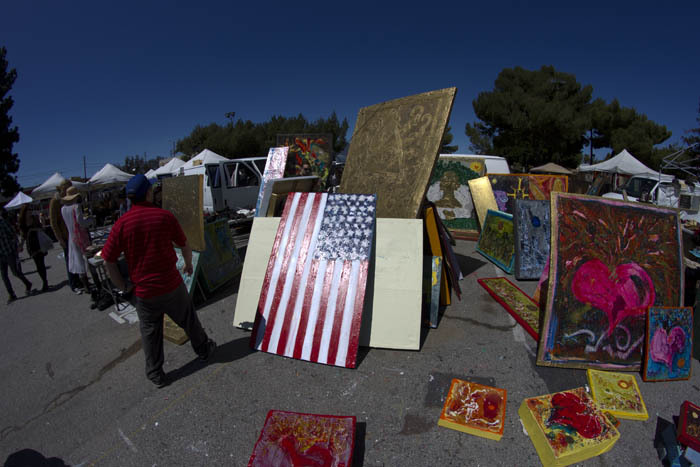 The Fairfax Flea Market is typical of what you’d find anywhere, maybe a little more artwork, but populated with a smattering a eclectic Californian’s. The temperature was around sixty when we got there. In L.A. that means dozens of women in coats or jackets, bare legs and cowboy boots. The plan was to take Stef and her boyfriend to dinner in Malibu. Helaine and I headed out early so I could shoot some photos. That started with Bedford Drive down in “The Flats” in Beverly Hills. 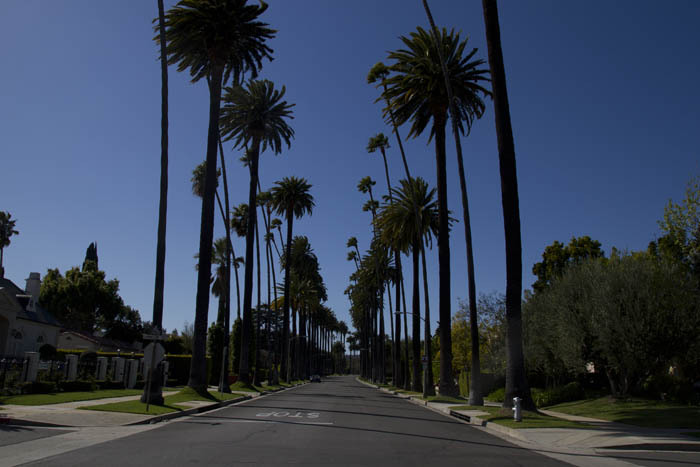 Bedford Drive is well known for its twin lines of tall, thin palm trees. Trust me, you have seen Bedford Drive before! We continued on Wilshire to the 405 then westbound on I-10 to the Pacific Coast Highway in Santa Monica. PCH parallels the coast through much of the length of California. We headed north stopping a few times along the way including one at Pepperdine University. How is it possible for Pepperdine students to concentrate when they sit on a bluff with a commanding view of the Pacific Ocean and Malibu? I’d just pull up a chair and stare. We continued all the way into Ventura County stopping across from Neptune’s Net. I know from previous trips this is a prime spot for surfers. 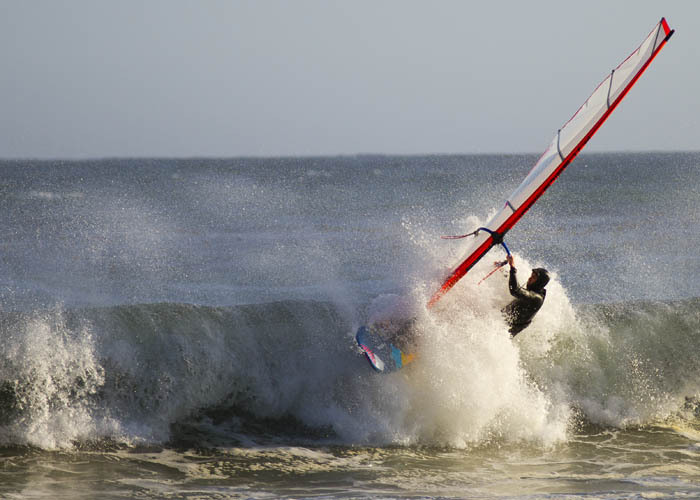 Today it was mainly filled with kite surfers in the taller than usual waves. Now we were backtracking, heading south toward our dinner reservation. One more stop this time with better access to to the beach. We finally ended up a Geoffrey’s&#185 a spectacular restaurant on a bluff overlooking the ocean. I knew this was going to be an expensive place. On their Internet site the menu has no listed prices! Also one of my Facebook friends tipped me off. We pulled into the valet parking area and got out next to an amazing Mercedes sports car. “How much,” I asked the valet? 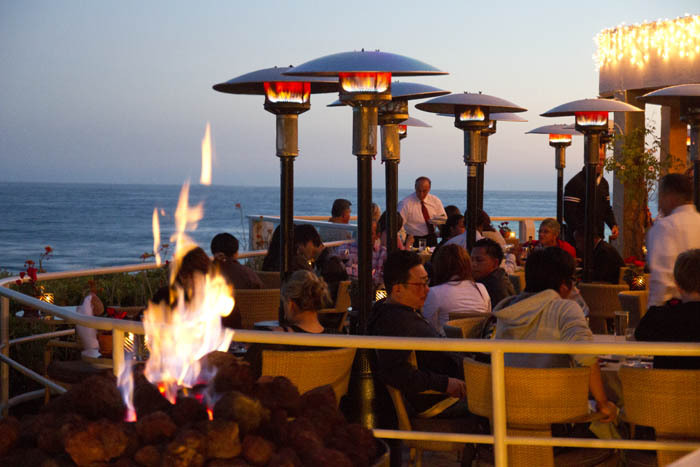 It was a little chilly to sit near the ocean, but the restaurant is equipped with a small army of propane heaters. Mother Nature be damned, Geoffrey’s controls the weather here! The restaurant was expensive, though nowhere near as much as I anticipated! The food was excellent as was the service. It was dark as we headed back to Sherman Oaks with my belly full and K-Earth blasting on the radio. &#185 – I pronounce Geoffrey “jeh-free.” They pronounce Geoffrey “jah-free.” Whatever. What was snow overnight has waffled between snow and sleet and rain. Sometimes we’ve gotten two or even all three at once! It’s the chef’s platter of weather. The word “unpleasant” was front and center in my forecast last night. That’s not a standard condition in the forecaster’s lexicon. It seemed to fit then and it’s verifying right now. It is unpleasant! Helaine flies home from SoCal tonight. She’s due in just before midnight at Bradley Field¹. I anticipate the flight will be fine. The weather will not. You have no idea how much I miss her. I’m glad she visited Stef. I’m doubly glad she’s coming back. California can be very alluring. Malibu, Westwood, Melrose and Disney in just a few days. Hopefully she won’t read this entry until she’s back in Hamden. The attached photos might be too much disincentive. She might not get on that plane! ¹ – Allow me to use its old school name from a more genteel era when we could meet friends to the gate and wear shoes everywhere. Snow that cover the branches as this one has, then stay in place waiting for me to grab my camera are unusual. The Eskimos were right! There a many different types of snow with very different looks and feels. Today’s fell just below freezing with no wind. It’s heavy. It sticks. It clings. It covers everything–no matter how tiny. Snow that covers the branches as this one has then stays in place waiting for me to grab my camera are unusual. Their also really pretty. I wonder if my Malibu visiting daughter thinks it’s pretty? Not that I hold a grudge. I’m writing this while flying over Colorado. We’re at 37,000 feet. On my way west, we were averaging a bit under 400 mph. With the wind at our back, Flight 265 is doing 570 mph! The pilot says we’ll be 20 minutes early to Midway. Back at LAX, the gate agent called “boarding in five minutes.” I shut down my laptop and began to pack. My laptop had other ideas. Without warning I was installing update 1 of 6! I semi-closed the lid, slipping my finger between the keyboard and screen to keep any switches from killing the power. That’s the way I boarded the plane. Helaine and Stef, reading this, are glad they weren’t around. Another embarrassing Geeky Greg moment. This flight is around half full. My rowmate, A middle-aged woman, is dozing in the aisle seat. I’m at the window. I chose the right side to see any prettiness associated with the sunset, which should soon be happening. Our country is beautiful from this altitude. Yes, the sophisticated traveler takes the aisle seat to have easier bathroom access. He’s too cool to look out the window. I need the scenery. We took off from Los Angeles and headed out to sea. After a few miles we turned north, paralleling the Pacific Coast toward Malibu. There was fog this morning. It covered the ocean near the shoreline, penetrating inland to the first foothills. Things must be slow on the PCH today. Inland, a layer of haze made the ground a little less distinct. I could also use the “S” word – smog. There’s some of that too. Already above 10,000 feet, we made a sweeping left 270 degree turn, finally heading east. A few minutes later I started seeing snow capped mountains. They weren’t far from LA. Nearly all that’s between Los Angeles and Las Vegas is desolate. Sometimes you’ll pick out a road etched into the vast expanse of dirt. Cryptically, every once in a while a geometric pattern shows up. Are they housing tracts, surveyed but never developed? Way out in the desert, it’s easy to wonder why this land would be considered for anything. I saw Lake Mead, but not nearby Las Vegas. The Grand Canyon appeared out my window, just a bit south of us. A few minutes later, I saw the bane of my last trip west. It was the gigantic Navajo Power Plant near Page, AZ. Close by was the Glenn Canyon Dam. Have I really been here enough times to start picking out landmarks from above? I shot a few photos of Monument Valley, looking south from the Utah side. The plane wouldn’t be there long. We were heading toward Colorado. There is plenty of snow out here. Originally, I thought what I saw was a light patch. Then I realized the trees and bushes poking through the snow was why it never looked solidly white. The slopes of the Western Rockies looked like chocolate cake with powdered sugar sprinkled on. Below me now, the mountains have disappeared. It’s Kansas. It’s flat. As far as the eye can see, there are rectangular fields. Sometimes the fields are interrupted by perfectly round patches where an irrigation system rotating on wheels or tracks has made its presence known. I’m not sure where the water comes from. So far, the vast majority of river beds I’ve seen have been dry. I’m tired. I’ll be exhausted by Hartford. I’ll need the rest of the weekend to recuperate from my vacation. Tonight I had dinner with Joel Denver. Joel and I were in radio first in Charlotte and then in Philadelphia back in the 70s. We became friends, but as is so often case, we moved and our lives changed until we fell out of touch. Joel’s company, AllAccess.com, is located on the Pacific Coast Highway in Malibu. Around 40 miles from where I’m staying, I gave the trip an hour. I headed up the 405, through the Sepulvada Pass and past the Getty Museum. You go under Sunset but over Wilshire, as Century City fills the view to the left. From the 405 I moved to the Santa Monica Freeway and finally whipped north onto the Pacific Coast Highway. Malibu is like no other place. Much of what’s here has changed since the 50s! It is among the most beautiful and most dangerous places in the world to live. Inland, homes sit on canyon walls. Most likely, one of your neighbor’s homes is below you! Homes are often lost to fire or slide, usually with minimal warning. On the ocean side, where the homeowner owns to the high water mark, lots have been maximized. As homes are rebuilt, the ocean side often ends up mainly glass. Lots of homes have decks, extending the property closer to the water. PCH passes by municipal beaches, open space, shopping and thousands of tiny, mainly rectangular, homes. Often they are plopped on lots with little room to spare. Driving north on PCH it’s hard to separate one house from the next. They are that close. With few garages or driveways, the curb lane is filled with parked cars. These teeny homes all are well over a million dollars apiece. I passed Cross Creek and then Webb. This is the real glitz area of the Pacific Coast Highway. The Malibu Beach Colony is in this area where PCH moves farther from the shoreline. Joel’s office is in a small office building just off the highway. I parked on the street and walked in. It was chilly tonight. He looks like he always did. His smile is there. His laugh is there too. Back in the 70s, I was single. Joel was married. He’s still married, just not to the same person. His wife Ria seemed very nice. Joel and I left for dinner. It was a sushi place a little farther north on the highway. We had lots to talk about. Both of us had been in radio. Joel was still connected with the business, but no longer on-air. Both the sushi and conversation were good. I enjoyed hearing a little about his business. Joel realized the Internet was the right place to publish back in 1995. He was able to anticipate the market. As is often the case with new media, his success has come at the expense of old line printed pages. His site can get the info out sooner and with less cost and hassle. I’m often amazed by the number of my friends who have done well. Here’s another one for the list. I’ll have to go back and spend a little more time next time. Sunny Los Angeles. It looks like it’s about to spend an extended period getting drenched. That can mean only one thing. I’m heading to L.A. I leave Saturday. Why am I going? No real clue. It’s just away. It’s a place I enjoy. I have some friends I want to see. Probably some photos to take too, if the weather cooperates. One friend, who I’ll be staying with for a few days, has grown a beard and then removed it since the last time I saw him. He has asked for anonymity on the blog – which will be respected. I’ll also be spending some time with my cousins in Orange County. I’ve never seen their house, near the retired El Toro Air Station, just inland from Laguna Beach. Two more stops are planned, both with people I haven’t seen in decades. Joel lives and works in Malibu. I knew him when we were both disk jockeys in Charlotte and Philadelphia. I have known him under three different names! Dave, who I first met as I turned 18, is from Marin County, near San Francisco. He runs a business designing, installing and repairing recording studios. He has lived an interesting and exotic life, including lots of time exploring Asia. He and I were ticketed for jaywalking across from the Roosevelt Hotel. Today, I was trying to think of how many times I’ve been to Los Angeles. Certainly a dozen. Probably closer to twenty. Though I once got lost and ended up driving Helaine and myself through some pretty sketchy neighborhoods, I know my ‘home turf’ of the Valley and West Side reasonably well. I will be taking Clicky and enough electronic accouterments to choke a TSA agent. No changing planes, but we are stopping in Chicago (MDW). January and Chicago. Wish me luck! Back in 1969, my first day on-the-air at WSAR was a little unnerving. Someone needed to break me in on the control board and make sure I knew what I was doing. That person was Skippy Ross, who became Skip Tyler, who became Bob Lacey. The photo to the left is Bob in 1975 at Hoover Dam. Isn’t radio great? All those cue scratched 45’s ago and we’re still friends. I picked him up at Bradley Airport this afternoon (I’m sorry sir, you can’t stop here. You’ll have to circle the terminal until your party arrives). We drove to New Haven so he could get a New Haven sweatshirt (in short supply in Charlotte, NC), then up to Glenwood Drive-in here in Hamden where he craved a grilled dog. Tomorrow Bob and I are driving to Maine. This won’t be our first vacation trip together, but certainly the first in over 30 years! The photo just to the left is me on that vacation, on the beach at Malibu. At work, some co-workers have speculated how well I will survive coastal Maine. We’re only staying until Wednesday. Will I make it or go stir crazy with limited cell service and the possibility of no Internet. No Internet! What is this, 1956? If there’s a little pause in the blog, you’ll understand what’s going on. Meanwhile, sometime tomorrow we’re piling in the car and heading to Southwest Harbor, Maine. “Clicky” is making the trip, so there will be photos. Oh – one more thing. Bob’s daughter Landon Lacey has a great website where she sells her handcrafted jewelery. not that my mention means much, but a free plug’s a free plug. Getting to Philadelphia was no problem. It was leaving that seemed to be the sticking point. I had a long layover in Philadelphia – over an hour and a half. The Embraer Regional Jet to Atlanta was in on time. We boarded on time. And then the announcement. The pilot came on from the cockpit to tell us thunderstorms around Atlanta were going hold us up. It would be an hour until he found out when we’d be!” And, since the gate was needed for another plane, he’d drive to a quiet spot for us to wait. I’d like to tell you the passengers protested, or the wait was interminable or some other tragic story of passenger pain, but it wasn’t that bad. We left Philadelphia about an hour and a half late. Is it just me or is it weird to be on an airplane designed and built in Brazil? The trip to Atlanta was bumpy, but uneventful. Getting off in Atlanta was another story. The terminal looked like a mall on the weekend before Christmas. It was jammed – as busy as any airline terminal I had ever visited. Helaine had found a great deal for a medium size car from Avis. That ended up being a Chevy Malibu. It is possible there is a car that has less style, but I doubt it. It looks like it was designed and built with absolutely no anticipation anyone would actually want to own one. They were right. My hotel is the Hilton Garden Inn – Perimeter in one of the many exurbs that ring Atlanta. This is actually a fairly nice hotel and a good value. And, along with everything else, there’s free high speed Internet service (though not enough signal at the desk in this room to use it from there). This evening (a late evening) I joined Mark and Annie, both of whom I worked with at Channel 8, for dinner. I left it up to them and we went to Ted’s… owned by Ted Turner and featuring Bison meat! We all had Bison burgers, which were very good. I also had New England clam chowder (could have been warmer and larger, but it was very tasty). This being Atlanta, Coca Cola’s world headquarters, I broke down and had a Coke, which was served from the glass bottle. Next stop was CNN, where Mark and Annie now work. This is interesting because there are familiar views in the CNN Center that I’ve seen for years. Visiting CNN at night, there were no on-air types to be seen. Most of their nighttime programming is from New York or Los Angeles (Larry King). Actually, that gave me more of an opportunity to look around. Their newsroom, directly behind the news set, may be the most photogenic TV space I’ve ever been in. Busy day. I’m going to bed. &#185 – The Fokker 100 is a small, though older, regional jet. USAir used to fly them to Buffalo. They were quite comfortable, except for the low ceilings. They were low enough that I once asked a flight attendant if her assignment in this particular model was penance for something she had done? Today, let me start before the beginning. We are in a beautiful hotel. Our room in it is very nice as well. But, there has been this one nagging problem. Last night Helaine complained that at the top of every hour, the room’s alarm clock chirped a tone. Ever the electronics wiz I looked, but could find no way to turn it off. I called housekeeping. This being a very good hotel, without skipping a beat they offered to swap our clock for another. While we were out today they did just that. We knew it, because when we returned the clock was a different color. Sitting next to the clock was a Casio “G” Shock watch… not ours. Coincidently, as I walked over to pick it up and look at it, it chirped. It was the top of the hour! It hadn’t been our alarm clock making the noise but a watch, left by a prior guest. Oops. This evening Helaine brought it to the front desk to, hopefully, be reunited with its owner. The plan of attack was to head to Malibu and take in the sights. Quite honestly, the weather could have been nicer. We have overcast skies with a bit of humidity. Not a perfect California day. 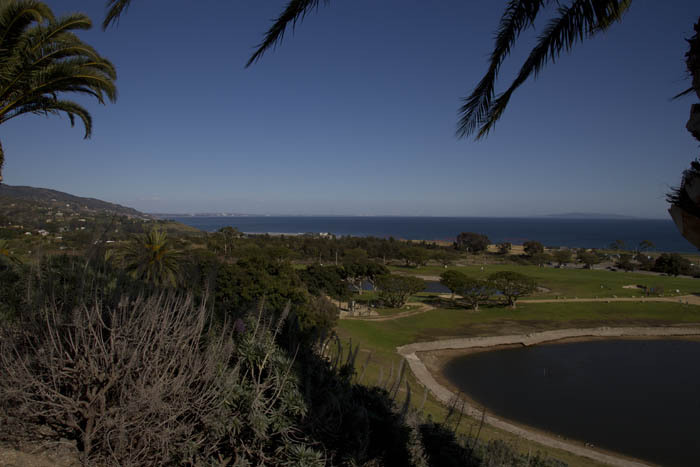 Malibu is a very easy drive from ‘headquarters’ in Century City. We took a left on Santa Monica, cut up Beverly Glen to Sunset, and then west past UCLA, OJ’s old neighborhood, Pacific Palisades and down to Pacific Coast Highway at the water’s edge. From there it’s a right turn and you’re traveling north toward Ventura County. We were all hungry, so we looked for a nice place and lucked out when we found Marmalade Cafe in a small Malibu shopping center. Luckily, there was also a Radio Shack as Helaine can’t stand the touch pad on this laptop and was desperate for a mouse. I had blueberry pancakes (excellent) and coffee (fair). Let me become petty for a second. Coffee is lightened with cream, not milk. When restaurants bring out that tiny pitcher with white liquid, it should be cream. It was not at Marmalade Cafe. We got back in the car and continued our trip north. 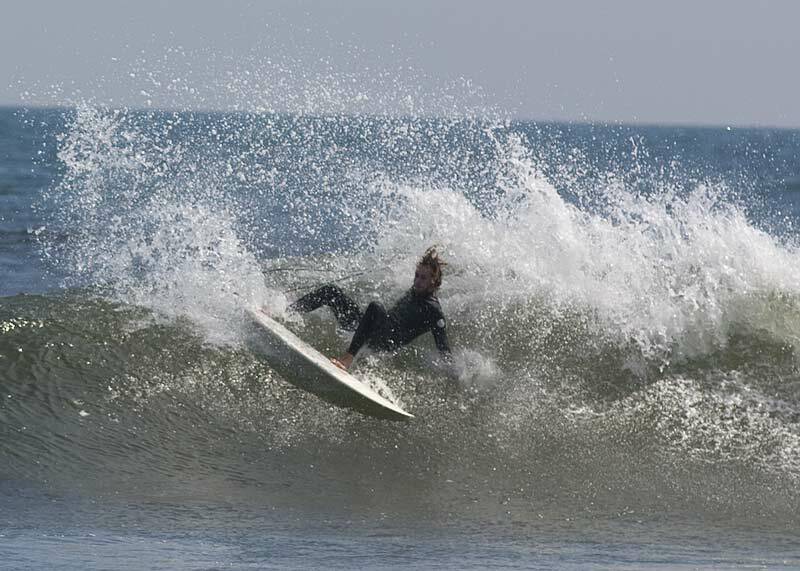 As we approached Zuma Beach I could see some surfers, so we pulled over and I got out to shoot some pictures. It was chilly and sandy and I suppose this qualified as a Geoff thing… a photo op. Helaine and Steffie stayed in the car. 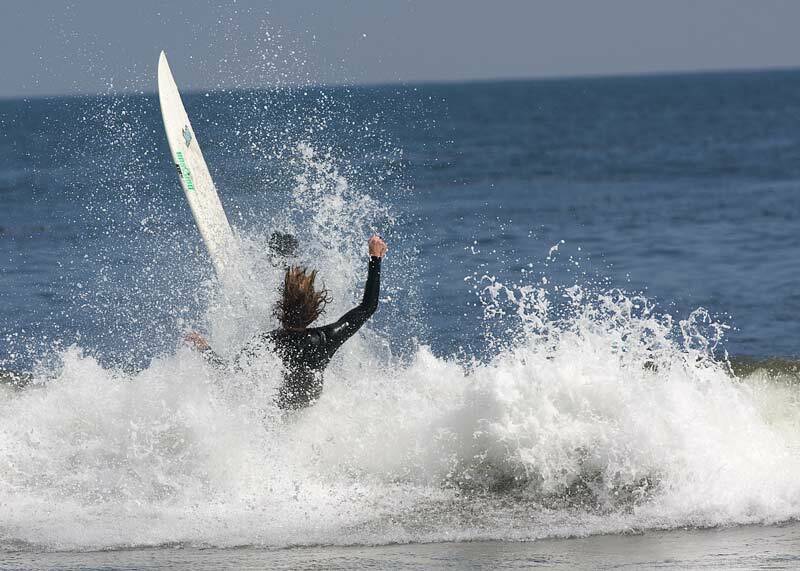 A few months ago I had seen some surfing shots on a website, and I wanted to try my luck. 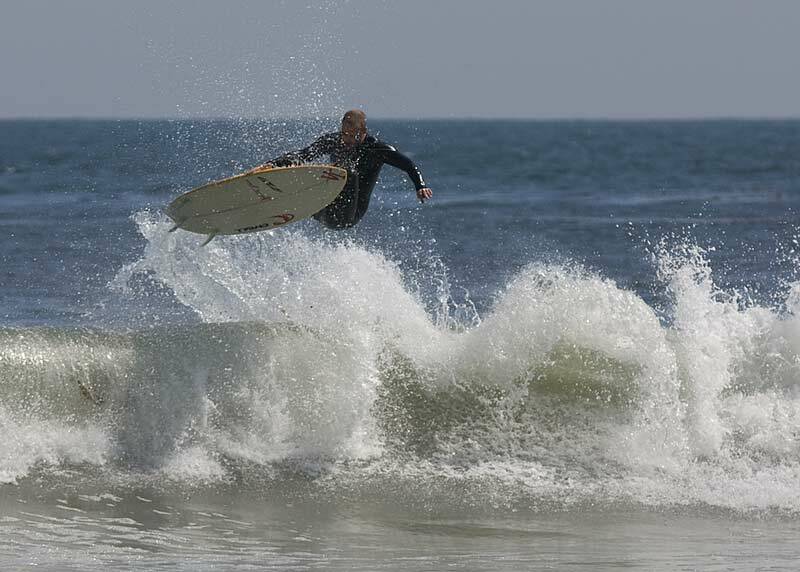 I believe these surfers had about the same skill level surfing as I have with photography, but I got a few good shots anyway. This was an opportunity to throw on the ‘long’ lens, my Sigma 75-300 mm. It’s not a bad lens, though it’s sort of slow&#185. 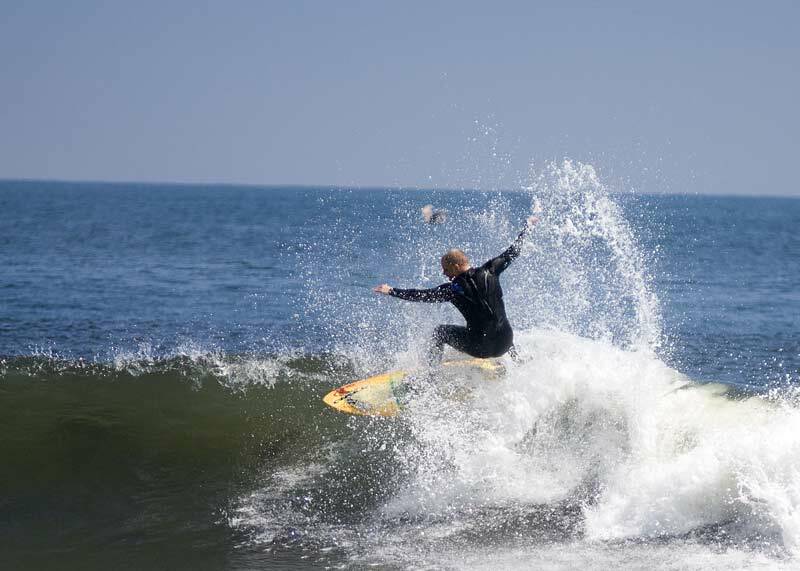 My surfers weren’t up enough to get a lot of shots, but I caught a few that were actually in focus, with the surfer atop his board. I’d like to try this again some time on a sunny day, and a little closer to the action. Part of the reason for this trip was to go to the Malibu Beach Colony. The Beach Colony is a very exclusive, very expensive neighborhood of homes. This is a community of the well known, well connected and powerful. The homes are behind a guard house on private roads. The backs of the houses are right on the beach. If it were up to the people who live there, the beach behind these homes would be private – but California’s laws are pretty explicit in this regard. The land from the mean high tide line down to the ocean is public right-of-way. We pulled into a public beach parking lot and then, while Helaine and Stef sat on the sand, I walked under a chain link fence and headed down the beach. The homes in the Malibu Beach Colony are ridiculously expensive. Of that, there is no doubt. They are also squeezed as tightly together as can be. Yes, you can paint your neighbor’s kitchen while standing in yours! The homes are mostly small, mostly two stories and all with incredible Pacific Ocean views. There is no Malibu architectural style. The homes are eclectic and totally different. As I walked, there were no residents to be seen. There were, however, a lot of workers – all seemingly Hispanic men. A group of four or five were repairing and painting some steps, others were cleaning and sprucing up homes. Actually there were some residents around – two dogs who barked at me as I passed their deck. Peoplewise, except for me, this beach was empty. It is a really beautiful place. Unlike the East Coast where most of the shoreline is on a coastal plain, there are cliffs and palisades along the immediate beach here. Not far to the east are steep hills separated by deeply etched canyons. It is there, on the hills, where the really big houses sit. Some are spectacular. Others, like this ‘castle’ are just weird. More proof that money doesn’t necessarily buy taste. When we left Connecticut there was still snow covering the grassy surfaces. Here it is definitely spring, with colors poking out as the rain fed ground gives life to flowers and plants. Later, this summer, months after the last rain, these plants will die and set the scene for the brush fires which will surely follow. It’s the natural cycle of California. The beauty is so great – the climate so friendly – that people build here knowing full well it could all go up in a puff of smoke… or wash away in a heavy rain. It does every single year, without fail. We headed back toward Century City. Unlike our trip west, this time there was traffic. We crawled back up Sunset, retracing our steps to the Century Plaza. We’d need some time because we were going out to dinner tonight with my friend Howard and his wife Maria. I’ve known Howard since our first day of college when he was (as I realized tonight) exactly Steffie’s age. We’ve been friends for over 35 years… and we’ve been friends through a lot. Howard and Maria live here. Howard’s been in the L.A. area for close to 20 years. He is a show biz manager – a profession I still don’t understand 100%. Ido know Howard’s a great manager, especially based on some of the work his clients have had. Tonight’s choice for dinner spot came from Steffie. We went to “Dolce” on Melrose Avenue. Melrose is very trendy, and “Dolce” fits in nicely, with celebs as the owners. The restaurant is dark with loud (though very good) music, mostly from the 70s and 80s. The five of us sat in a banquet type booth. It is not the optimal table for conversation. Though food was secondary in Steffie’s decision process, this was to be a meal. “Dolce” features Italian cuisine, and it was delicious. I had a pasta dish with Italian sausage. Helaine and Steffie had pasta with lobster. The portions, though not large, were decent. The food came out piping hot. Or waiter was attentive. For desert we all had chocolate souffles which were rich and tasty. Unfortunately, it was milk and not cream (again) for my coffee! I know, I’m getting obsessive about this. Considering this restaurant was picked more for its back story than it’s food, we were very pleasantly surprised. And, all things considered, the meals were reasonably priced. Tomorrow, it’s dinner out with friends again! I’ll be 400 pounds by the time I get home. &#185 – The relative speed of a lens refers to its ability to capture light. A slow lens captures less than a fast lens, forcing you to slow down the shutter speed. The faster the lens the better… and of course the more expensive. I just went out on the deck and it’s cloudy. Not only that, there’s the feel of ocean air – the humidity’s up. It makes no difference. We’re going to Malibu to walk and look. Tonight, dinner on Melrose with my friend Howard and his wife. Author Geoff FoxPosted on March 17, 2005 Categories California Vacation Trip Reports 2005Tags Howard, MalibuLeave a comment on Where’s The Sun? I had a ‘date’ for lunch, so I drove Stef and Helaine to Rodeo Drive in Beverly Hills. There was a time when I had to explain Rodeo Drive to people who had never been to L.A., but it has become larger than life and universally known. I wasn’t there, so I don’t know much of what went on (and since it was primarily shopping, I don’t want to know). There is one story the girls shared with me. As they walked down the street they passed a trash can with smoke pouring from it. A man walked out of a store, poured a bottle of water in&#185 and left. But the smoke continue to waft out. Within a few minutes, the sound of sirens. Then a Beverly Hills fire truck, police cars and traffic agents showed up. The street was blocked off and firefighters, direct from central casting, put out the smoldering trash receptacle. Meanwhile, back in Century City, I was pulling onto the 20th Century Fox lot for lunch. Originally I drove in from the main entrance on Pico. The security guard there re-directed me to the parking garage off Galaxy. Though I was farther from my destination, that was a good thing. I got a chance to walk through the Fox lot. Make no mistake about it, this is a movie factory – which is very cool. Everywhere you walk are signs you’re in “Hollywood.” Though I saw no production in progress, it was obvious there was a lot going on. There is no strange thing I saw at Fox. There were at least two vending boxes selling the NY Post. Granted, it is owned by Rupert Murdoch who also owns Fox, but it’s just a strange place to see the Post on sale. Lunch was with someone I first met in 2nd grade! He is now a highly placed executive at Fox Television… and that’s why I’ll preserve his anonymity. He’s a very nice guy, was very bright back then, and hasn’t changed. He is in a business where each and every decision has dollars attached to it. It’s a lot of pressure, a lot of accountability and I think he enjoys it. We talked about people we knew from school and our families. In some ways our lives have run parallel. We both started families, having children, later in life. It was really a great lunch and fun talking with someone who has insight into a part of my business that I normally have little contact with. As we said goodbye, the Robert Blake verdict came in. Wow. No one more surprised than me. Well, maybe Robert. I left Fox and headed to Beverly Hills to pick up Helaine and Stef. There had been a whole lot of looking and a little bit of buying. We headed back to the hotel so I could pick up my camera. When we got there I noticed the satellite trucks and microwave vans lining up on Avenue of the Stars, in front of the hotel. “Arnold” was coming to speak at the Century Plaza tonight and protesters were expected! Coverage was assured. After a quick break we headed back to the Valley. We wanted to take a look at a house. It was 4:30 and traffic on Santa Monica Boulevard was awful. The 405 was worse! In the car, the subject turned to driving on California freeways. The 405, for instance, is 5 lanes in each direction. If you’re used to driving on 2 or 3 lane Interstates, 5 lanes can be unnerving. Steffie’s theory is the right line on a 5 lane highway isn’t the breakdown lane, it’s the crying lane! People who are flustered, or otherwise unable to handle the highway pull to the side and cry. She might be right. We cruised through Encino and Sherman Oaks, stopping at “Belle Gray,” a boutique owned by Lisa Rinna. Though Stef bought a shirt, she said the folks in the store weren’t particularly friendly or helpful. After stopping at Ralph’s to pick up bottled water and fruit for the room, we headed to the Sherman Oaks Galleria and dinner at the Cheesecake Factory. The Galleria was the mall setting for the movie “Fast Times at Ridgemont High.” Of course nearly every place in the Los Angeles area has been the setting for something. A few years ago, after falling on hard times, the mall was closed, gutted and rebuilt. What is there now is smaller and open air. In fact for dinner, we sat under a propane heater on an open air patio. The night was beautiful. The portions immense. We ate an left. So, here it is 9:39 PM, as I type. Helaine and Stef are in bed and asleep. I won’t be far behind. Tomorrow we’re planning on heading to the Pacific Coast Highway and driving through Malibu. Later, we’ve got dinner reservations with some friends. More tomorrow. &#185 – This being Beverly Hills, I assume it was Evian. With snow on the way for tomorrow and chilly temperatures still in the forecast, we are excited about our upcoming vacation to California. We’ll be spending time in Los Angeles and then Palm Springs (someplace we’ve never been). Many times, I have heard people talk about going on vacation and not wanting to do touristy things. Not us – the tackier and more touristy, the better! We’ll be going to Universal and walking the beach behind the beautiful homes in Malibu. I’ll take my camera and shoot thousands of shots. We had hoped to see three TV shows but it looks like we’ll be 0 for 3 in that regard. The OC, which is a show that doesn’t have a studio audience is shooting in Miami. So, no matter how much help I had from highly placed friends, that isn’t happening. Same thing with Jay Leno. Here’s a guy who’s a workaholic… probably does the show 50 weeks a year. Gone. The show will be dark. Bad timing on our part. We had also hoped for Ellen Degeneres, but again, circumstances got in the way. Actually, Helaine tried months ago, hoping that our out-of-town address would get us in. We never heard from them. Today a well placed friend tried on our behalf, only to be told there were no VIP seats (he requested VIP treatment – not me). Oh well. We do have reservations for dinner at some ‘happening’ restaurants, and I’ll write more about them while we’re there. One of the fun things about a California vacation is the chance to see friends who live there and aren’t at close range too often. One of the friends I’ll be seeing is someone I’ve known for nearly 50 years (that was sobering just to write). We’re having lunch our first full day in. The other two have been friends with each other, and me, for nearly 40 years. My Cousin Michael lives in Southern California with his family and we’re looking forward to spending time with them in Orange County. Stef wants to go to Laguna and other beach communities. Me too. Helaine three. For us, the California lifestyle is very foreign… which makes it fun to play in it for a while. Whether it would lose its luster if I had to deal with it every day is another story. The trick to California living is realizing it’s not a place to be unless you’re well to do. Southern California is not a good place to be in the middle class – even the upper middle class. Los Angeles is meant to be lived properly with a lot of money. It is definitely a classist society. For ten days we’ll make believe we belong and hope no one catches on.